Paul Weller’s "Starlite" Official Promo CD! – Paul Weller News! 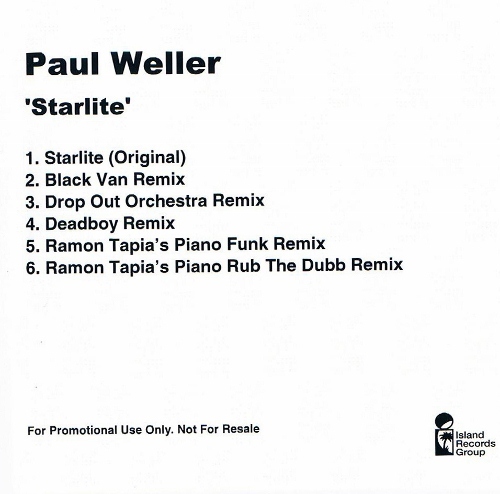 Paul Weller’s "Starlite" Official Promo CD! 3 Comments on Paul Weller’s "Starlite" Official Promo CD! Here’s a photo of the “Starlite” promo CD that has been popping up on some auction sites the past few days. Aside from the vinyl, this seems to be the only official route of getting the non-mp3 version of Paul’s Summer single, as a CD version, up to this point, has not been announced for commercial retail release. this is my favourite summer single as it was come to milton keynes a lot of years ago…..
sorry only 12″ single release. i'd prefer a cd format too. never into mp3 downloads btw. You can download the Ramon Tapia remix at junodownload.com it's sharp! Next Entry Universal Has Released The Jam’s "All Mod Cons" via Their "Back To Black" Vinyl Series!